4018B types consist of 5 Johnson-Counter stages, buffered Q outputs form each stage, and counter preset control gating. CLOCK, RESET, DATA, PRESET ENABLE, and 5 individual JAM inputs are provided. 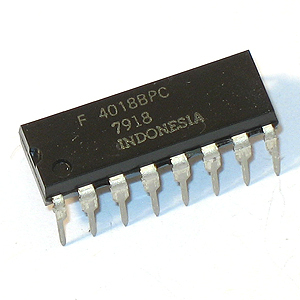 The counter is advanced one count at the positive clock-signal transistion. Schmitt Trigger action on the clock line permits unlimited clock rise and fall times. A high RESET signal clears the counter to an all-zero condition. A high PRESET-ENABLE signal allows information on the JAM inputs to preset the counter. Anti-lock gating is provided to assure the proper counting sequence. 16 pin DIP. Actual brand may vary from picture. Sold in a package of 25.